Last week I flew down to Salt Lake to help my sister with baby #4: Ava Vivian Carley. Could you die with how cute that name is? And if you think the name’s cute, you should see the baby. I could die. 3. Hold baby some more. 5. Hold baby some more. 7. Hold baby some more. 9. Hold baby some more. Being around this blooming young family was like stepping right back into the past. Jumping out of my world into theirs reminded me how long that chapter of motherhood has been closed for me, and it was surreal–in a happy way. I found myself nostalgic about the slow quiet days, now long gone, that I used to share with my little ones. But then I also found myself thankful that I was given the chance to savor such days at all. And after seeing how hard my sister was working, I discovered gratitude for the fact that those “tender years” don’t last forever. As mothers, we often claim that we want to capture time with our children, to make it stand still. But do we really? What if we could? It would prove a curse. Instead, we are allowed to transcend that unique piece of time–and the toil that accompanies it–and remember only the good stuff. That’s a gift. Yes, I do miss the camaraderie of young motherhood. And the fierce loyalty my children showed me, daily, when they were toddlers. And the slower pace of it all. And the way my 18-month old daughter’s hair used to grow fine and straight on the top of her head but in long, loopy curls out the sides, making her look something like Bozo the Clown. The parallel masses of curls would flap back and forth, back and forth in the breeze as I walked with her perched on my hip. Do I ever miss that. But I don’t miss the sleep deprivation. Or the tantrums. Or the diapers and carseats, the nursing and negotiating. Lots to love about young motherhood; lots to love about leaving it behind. Those early, hazy years really are golden. But the later years are platinum, because you can leave your own kids home with their father, swoop into town as the Beloved Helpful Aunt, feel all the love, then fly home to sleep for eight uninterrupted hours, night after night, in your blissfully kid-free bed. The early years of parenting are precious, but getting through them isn’t such a bad thing either. Hang in there, young moms. There’s a lot of good times–and tons of sleep–waiting for you just around the corner. 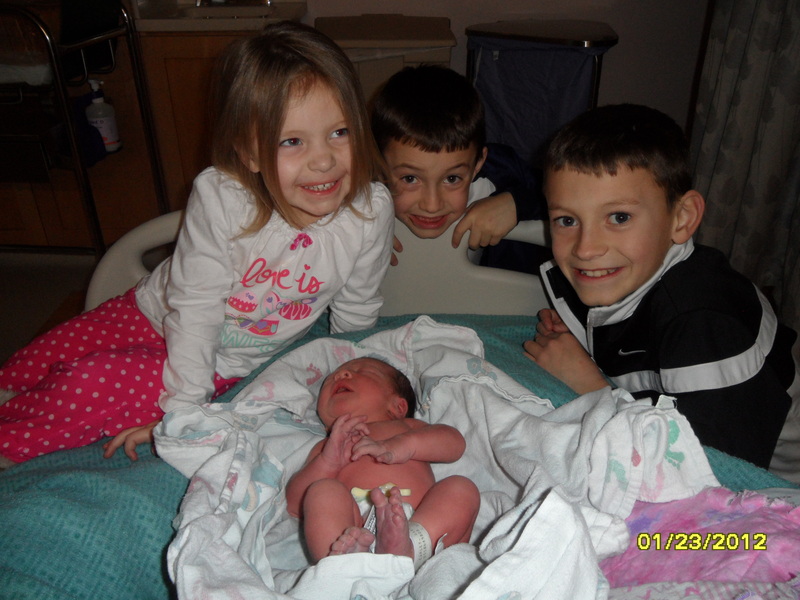 Allie, Kyle, Chase, Baby Ava. don’t do it, ladies. just don’t do it. Previous Article Throwing a birthday party for your seven-year old boy is kind of like being on the Stairmaster. So sweet Jen and so perfect! love her name! Congrats to Jaimy and family! You are a good aunt, jen! You are a good aunt, jen. Love this post. I shed a tear or two. It was fun to see you for a minute while you were here, even if you did cut into my Jaimy time! I did not see you in your sweats, but I can definitely attest to the Dirty Dancing watching.